South Wales is known for coal mining. North Wales is known for slate quarries. Everywhere you go in North West Wales you will almost certainly find an abandoned slate quarry. Some never became commercial. But others made their owners huge fortunes, and the aftermath of the quarries are difficult to miss. The main centres were Blaenau Festiniog, Corris and Bethesda. But other existed, smaller and now almost forgotten. 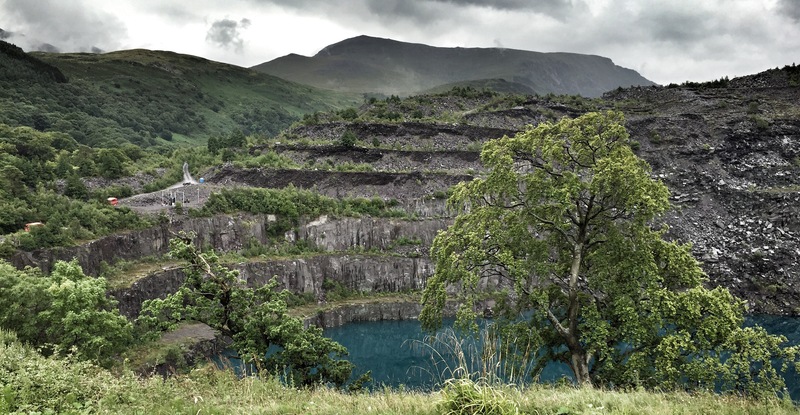 But the fact remains there where hundreds of quarries and slate mines scattered across the region. Now all are now closed, but the hollowed out maintains and scarred mountain sides remain. A testimony to the labour, sweat, tears and often blood of the quarry men making fortunes for the few and hardship for the many. These industrial ruins have to survive somehow, and now a number of these are Tolkiensien landscapes are now visitor centres interpreting the last, but also provide others with an adventurous spirit with an adrenalin fix. 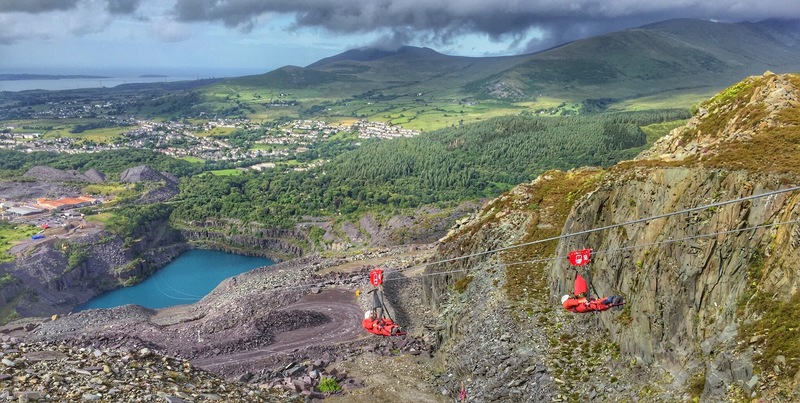 None more so than Bethesda Quarry, home to the longest zip wire ride in Europe. 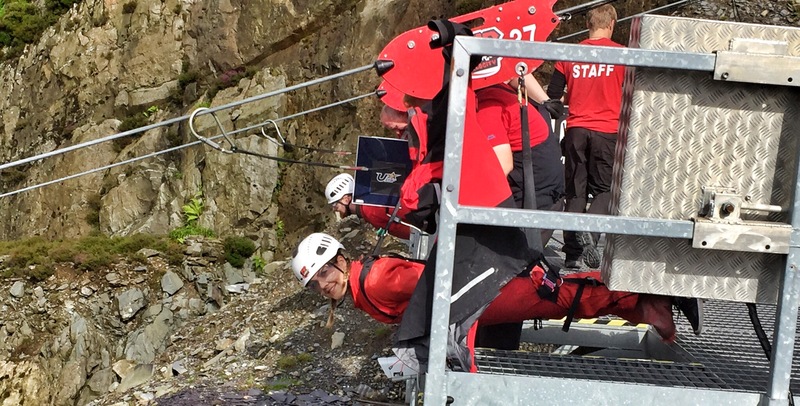 So what else is there to do with the Challmonkmoore annual get together – we had to try fly for a mile at 100mph along a little wire 500 foot above hard rock! The whole day needed organisation. And there’s one thing we are all,good at and that is organising things – but not necessarily together. Before we even got anywhere near a wire we had to have a briefing. What we were allowed to do – not much! 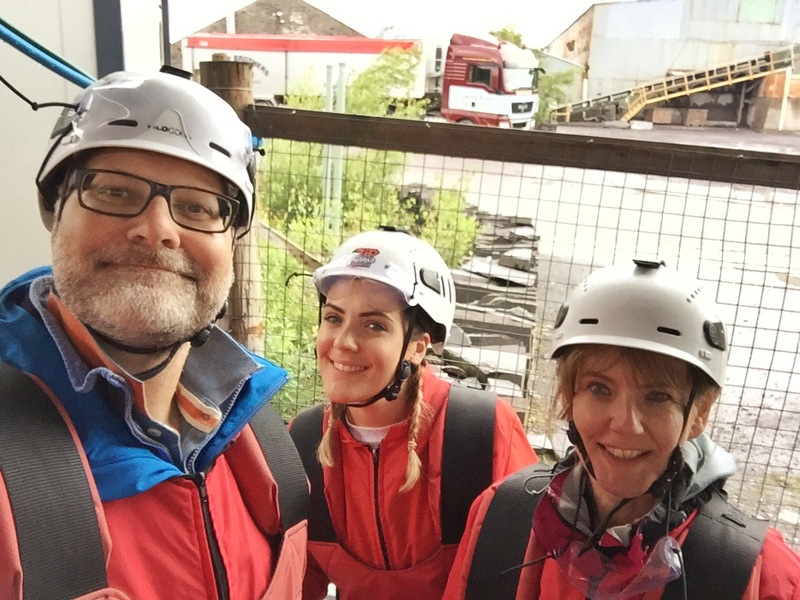 What we were not allowed to do – a lot! Then much to Number One Daughter’s chagrine we had to dress up in shapeless one piece jump suits and be fitted with harnesses. Even for a fashion clueless Charlie like me I could see this as not a good look. Not sure that red is my best look! We were then walked to a test zip wire that was designed to test our metal and be sure we were up to the “Big Zipper”. The Little Zipper has a maximum speed of 65km/hr and starts at 195m before dropping a total of 27m. Aha we laugh in the face of danger! Though Aunty was not so sure as she was left hanging in midair looking down the wire towards then end. I think my name was used in association with a few curses at this point. So we survived that one. We were then herded into the back of a flat bed truck and driven up to the top of e quarry. The views over the Carneddau and the shear expanse of e quarry areas were impressive. The drive took about 15-20 minutes in total, and exposed the shear rock faces blasted out of the living mountain. The scars are evident all over the hill side. the end of the zip wire is way down there on the plateau above the lake! After another briefing we were harnessed attached to the Big Zipper. Now this is a completely different proposition to the Little Zipper. All of a sudden as you lie in your harness with only the good will and training of others you are attached to a little bit of wire, with nothing to stop you as you fly at 165km/hr over 1560m. Then add to that the ground is 152m below – the adrenaline starts to flow. Boy what a feeling! Number One Daughter posing as usual! And Aunty is launched into space! Did Aunty and Number One Daughter enjoy it? You bet! When we met up at the end they wanted to do it again! So did everyone else. Next year maybe. Lovely landscapes but you can keep your adrenalin fixes. Not my cup of tea! Go on Annie – you know you want to give it a try! If you’ll excuse the expression, not a chance in hell! That’s pretty impressive. I think I would need to be sedated to try it. Superb Paul! Well done to all, I don’t think I could have done this. I have no head for heights! Aunty is not known for her adventurous spirit – but she wanted to do it again afterwards.